Start your journey to one of the most exciting destinations in the world with the arrival at Ngurah Rai Airport where you will be received by one of our representatives. Check into the pre-booked hotel and enjoy the rest of the day at leisure activities or exploring the surroundings with dinner and overnight stay at the hotel. On the 2nd morning after breakfast enjoy the half day sightseeing tour of Uluwatu Temple this is also known as Pura Luhur Uluwatu Temple. It is one of the nine directional temples of Bali meant to protect from evil spirits. It is a famous Hindu sea temple located on the top of a cliff that overlooks the Indian Ocean. It is magnificent in architecture and offers the stunning views of the surrounding which make it one of the best vistas in Bali. Later on, proceed to visit the Garuda Wisnu Kencana Cultural Park and then proceed to enjoy the romantic dinner at Jendela Restaurant. Return back to the hotel for dinner and overnight stay. On the 3rd day of your Bali package from India enjoy the luxurious aromatherapy treatments at one of the luxurious resorts of Bali which is renowned for meditation and Ayurveda retreats. The evening is free to indulge in leisure activities with a scrumptious dinner and wine at Jimbaran/ Kedonganan beach. Return back to the hotel for dinner and overnight stay. On the last day of your Bali holiday package from India check out from the hotel after morning breakfast to board a flight for the return journey. 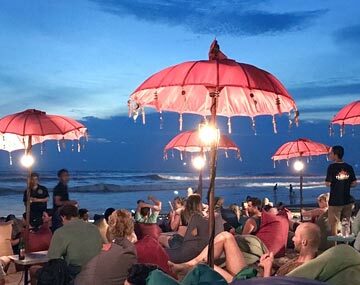 The spectacularly beautiful island of Bali in Indonesia is a perfect destination for honeymooners to begin the new chapter of their lives in the arms of Mother Nature. History dated back over 1000 years it offers limitless attractions to its visitors. Rich tribal culture, magnificent temples, sun-kissed beaches luxurious resorts, world-class amenities and lip smacking cuisines make it a perfect destination to enjoy the best time of your life. BookOtrip knows how to make things better for you and thus offers you whatever best for you while travelling. We offer you great deal hotel accommodations, discount deals on flight bookings, travel insurance, car rentals and holiday packages so that you can enjoy a memorable holiday trip. So hurry! Grab the opportunity and avail Bali honeymoon packages to enjoy one of the best holidays of your life.